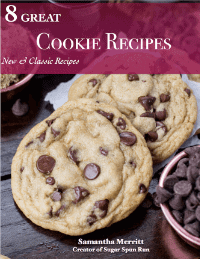 Welcome to the July Recipe of the Month: Brownie Cookies! These Brownie cookies are thick, chewy, and ultra chocolaty (they’re made with 3 different types of chocolate, so you know they’re good!). With their shiny, somewhat crackly tops and their super soft, melt-in-your-mouth interiors, I think you’re going to enjoy these better than almost any brownie recipe you’ve tried before! Welcome to my third Recipe of the Month: Brownie Cookies! 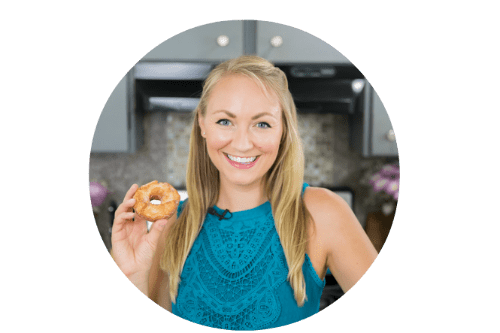 In case you missed the rundown on this whole “Recipe of the Month thing”, each month I’m selecting a different recipe that I’d love for each and every one of you to bake along with me! And, if you do participate, you can also enter to win prizes like a $50 Amazon Gift Card, so make sure to check out all of the details that I shared yesterday on how to participate. 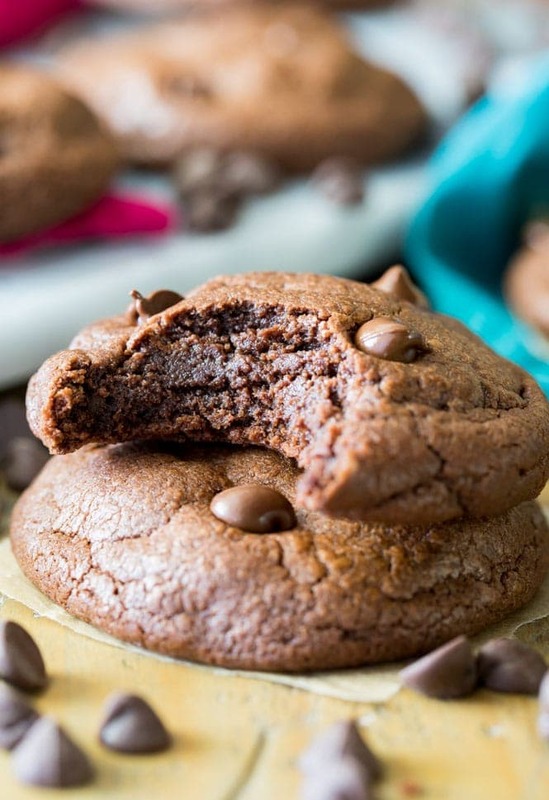 For the month of July (and July only, so you’ll have to submit any entries before the end of the month), we are doing these richly chocolatey Brownie Cookies, a fairly simple cookie recipe that requires a bit less technique than last month’s Angel Food Cake. This recipe also requires significantly more chocolate, so let’s get right to that. As I mentioned, there are three types of chocolate that we’ll be using today. 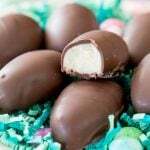 First: 2 oz of unsweetened chocolate. 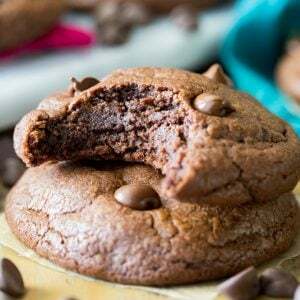 I tried this recipe with a handful of different chocolates (and I also tried it with less chocolate and with more, so many test batches of these brownie cookies went through my oven!) 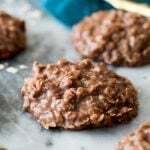 and found that using just 2oz unsweetened chocolate gave these brownie cookies the best, deepest chocolaty flavor. Next, we add a half cup of natural cocoa powder to our melted chocolate and butter. Make sure to stir this in while the butter/cocoa powder is still hot/warm, it helps the chocolate flavor of the cocoa powder to really develop (don’t add the sugars until this mixture cools for several minutes, though, the heat from the butter can melt the sugar and then you’ll just have a mess on your hands!). Finally we add chocolate chips. I like to fold semisweet chocolate chips into my batter and press extras on top of each cookie while it’s still hot from the oven. Don’t over-heat your butter/chocolate when melting. Cut your butter into pieces and chop your chocolate into pieces as well, and then microwave in 15-second increments, stopping to stir really well after each increment and heating only until the butter and chocolate are melted. If you heat these too long in the microwave without stirring you run the risk of seizing your chocolate, which means you’ll have to start right back at the beginning. The instant coffee is optional but I highly recommend it — and it won’t make your cookies taste like coffee. What it does do is it enhances that chocolate flavor, making for (as I’ve said a few times now) supremely chocolatey cookies. I also use instant coffee in my favorite brownie recipe for this same reason. Chilling the dough is critical! Just 30 minutes is enough with these cookies, but don’t skip this step or your cookies won’t be as thick and chewy as they should be. 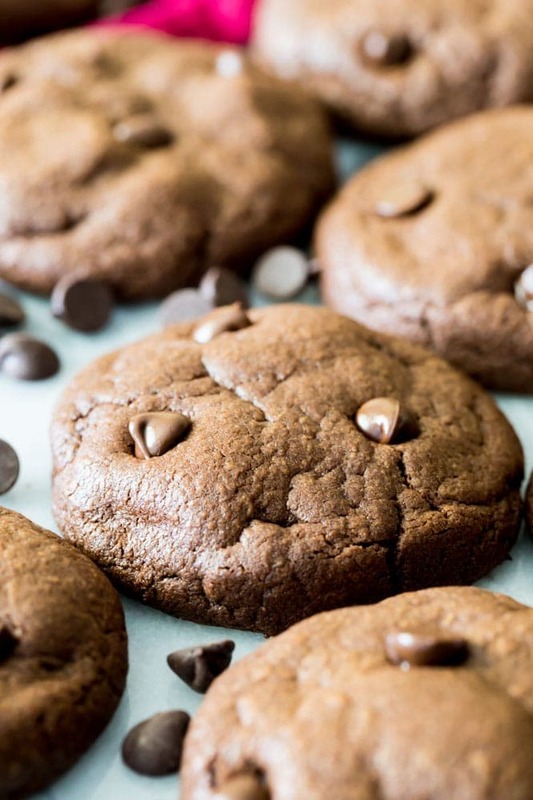 For an extra hit of chocolate, gently press a few chocolate chips into each cookie after baking. I first shared this tip with my chocolate chip cookies and have used it a hundred times since. Within 1-2 minutes of removing your brownie cookies from the oven, you can press a few extra chips into the top of each cookie. Totally optional, but it gives you some extra chocolate and makes the cookies look nice. 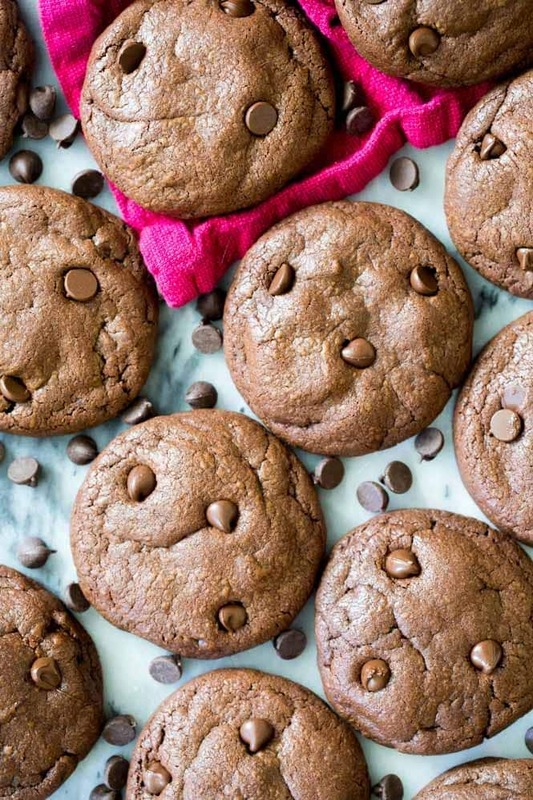 Enjoy, and don’t forget that if you make these brownie cookies in the month of July and share them with the hashtag #sugarspunrun you’ll be entered for a chance to win a $50 Amazon gift card. 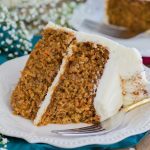 Make sure to see yesterday’s Recipe of the Month post for full details! 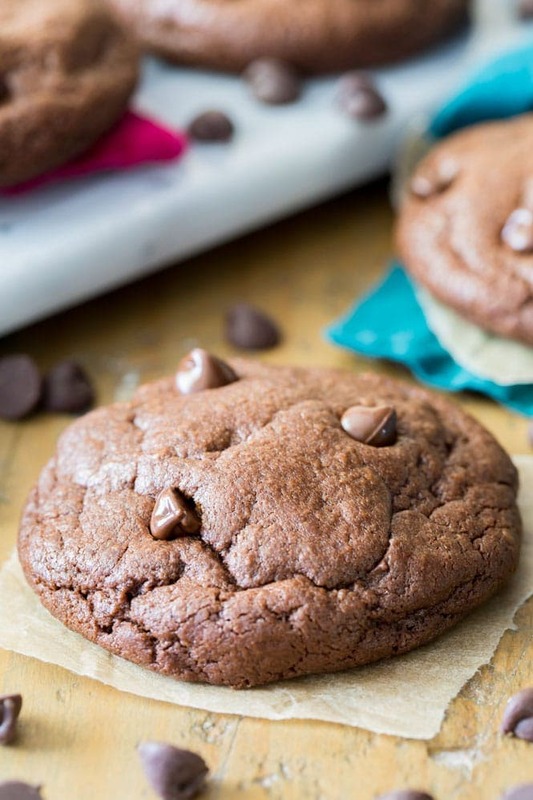 These Brownie cookies are thick, chewy, and ultra chocolaty (they're made with 3 different types of chocolate, so you know they're good!). Combine your butter and your unsweetened chocolate in a large microwave-safe bowl and heat for 25 seconds. Stir well and then return to the microwave, heating for 15-second increments and stirring well after each one, until chocolate and butter are completely melted. Immediately add cocoa powder and instant coffee and stir well. Allow mixture to cool for several minutes before proceeding. Add your sugars and stir well. Add egg, egg yolk, and vanilla extract and stir until well-combined. Set aside. Gradually add the dry ingredients to the wet and stir until well-combined. Stir in chocolate chips. Cover bowl with plastic wrap and transfer to the refrigerator to chill for 30 minutes. While dough is chilling, preheat oven to 350F (175C) and line a baking sheet with parchment paper. 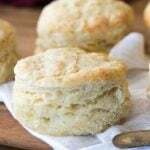 Once dough has finished chilling, scoop by heaping 1 1/2 Tablespoon-sized scoop and roll briefly between your palms to form a smooth round ball. Place cookie dough at least 2" apart on baking sheet and bake on 350F (175C) for 10-11 minutes. 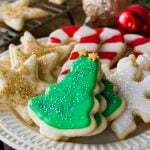 Cookie should still seem very soft in the centers and almost under-baked, they will finish cooking as they cool on the baking sheet so let them cool completely on the baking sheet (they will be too fragile to move before they've cooled). 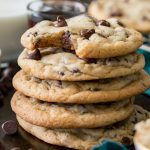 If desired, gently nestle additional chocolate chips into the top of each cookie within 1-2 minutes of removing cookies from oven. 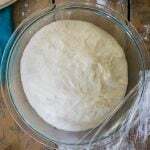 Keep dough chilled while batches are baking in the oven. Never place cookie dough on a hot cookie sheet. Ah-mazing! Willmakeschool lunch special for the grands this week!! 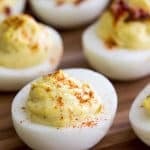 Made them and even if I don’t win the recipe challenge it was so worth it, my daughte is now OBSESSED With these!! What does Cornstarch in UK mean? 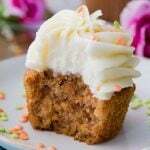 Was contemplating working around the house today, July 4; now am, instead, contemplating baking a batch of these to take to work for tomorrow! These look great! 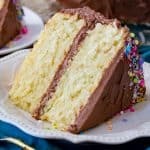 Totally fine with any and all recipes that require a lot of chocolate! Can’t wait to try!